For comic book fans, there probably has not been a more mishandled franchise than Batman, in part due to Joel Schumacher's unforgivable mangling of the series. enhanced by introducing such odd casting choices as Val Kilmer and George Clooney (wha...?) as everyone's favorite masked vigilante, to say nothing of rendering the characters of Robin and Batgirl as not much more than well-scrubbed pretty faces ready to spout one-liners. Things seem to have gotten back on track with Christopher Nolan's recent Batman Begins, which harkens back to the tragic roots of the hero, something that first came to light with Frank Miller's brilliant graphic novel reinvention of The Dark Knight Returns in 1986, which painted the character as more than a bit troubled, and more or less championed the whole "dark superhero" thing. Thankfully, Tim Burton's 1989 treatment of the character owes more to Miller than it does Schumacher. But I think most people wouldn't have expected anything less, considering the general level of weirdness Burton seems to gravitate towards, though this one is still not as somber as Nolan's version, opting instead to play more like a graphic novel. The choice of Michael Keaton as Bruce Wayne/Batman, while perhaps just as inherently strange as Kilmer or Clooney to some degree, is in hindsight the best of the three. Back in 1989 it was kind of a jarring bit of casting, with Keaton at the time yet to have really have dipped into any serious roles, and it was something of a hurdle to accept Beetlejuice as Batman. Or at least it was for me. The lucky thing for Keaton, which may have helped make his portrayal less intrusive, was that he gets overshadowed, almost becoming a secondary character. Jack Nicholson runs away with this one as the maniacal villain The Joker, a role that helped to redefine the required place of an over-the-top bad guy for the genre, which was nearly ruined for good a few years later by Arnold Schwarzenegger as Mr. Freeze in one of the Schumacher tragedies. Nicholson makes it look easy here, grinning widely and spewing venom with the kind of rabid, evil glee that really seemed to be an extension of the dangerous and deadly Arkham Asylum-era Joker, as written in the graphic novel by Grant Morrison. The Sam Hamm screenplay dabbles in character origins—more for The Joker than anyone—dropped into the shadowy recesses of Burton having painted Gotham City as a dark, twisting landscape full of bizarre skyscrapers and a keen, post-Gothic retro-look. The story relies more on developing the villain than really telling a layered, substantive story, though it almost seems like Shakespeare when compared to Burton's Batman Returns followup, which was all villain and essentially no story. Aside from Nicholson going gaga as The Joker and the atypically strange Burton darkness, there is a sweeping score from Danny Elfman (here remastered in DTS) that is just about flawless in its emotional punch, and the main theme is up there with Star Wars and Indiana Jones as one of those cinematic pieces of music that always manages to get my pulse racing. This is one of my favorite Burton films, maybe tainted by my own longstanding fascination with Batman, and until the Christopher Nolan version it was really the only rendition that seemed authentic. Image Transfer Review: This special edition carries a new transfer in what appears to be 1.85:1 anamorphic widescreen, and the improvements over the early version are substantial. Colors look very natural throughout, and this new transfer really paints them significantly deeper and with more consistency than before. Equally deep blacks and well-defined shadow levels look strong, and keep the dark sequences from coming across muddy. What I found to be most impressive on this new transfer was that there is far more clarity in image detail here, and noticeably less instances of fine grain. Audio Transfer Review: New this time around for the SE is a moderately spiffy DTS track, paired up with the previously issued Dolby Digital 5.1 mix, as well. It's kind of like what was done with David Cronenberg's The Fly, where a 1980s feature was expanded aurally so the sound doesn't "feel" like a film from nearly two decades ago. Directional movement on both mixes is fairly active, filling out the soundstage by creating enough movement across the front channels to help sell all the action sequences. Rears and sub usage isn't overdone (though a tad deeper via DTS), but it is effectively rich. The real winner is Danny Elfman's score, certainly one of his finer works, which here sounds magnificent and dark. A French 2.0 track is also included. 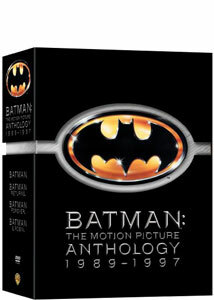 Extras Review: An excellent job from Warner on the extras for this special edition, the best of which is found on Disc 2. Not bad, though pale by comparison, is on Disc 1, which carries the feature, busted into 38 chapters (with optional subtitles in English, French or Spanish), a theatrical trailer and a commentary track from director Tim Burton. Now Burton, cool hipster that he is, is not known for his high energy recitations on any of his commentaries, and this time around it's the same type of a surprisingly decaf presentation, though he does seem a bit perkier than he has in the past, even laughing a few times. He gets excited about the title sequence and production design elements, and talks about "the unraveling" of making a big Hollywood movie. There are few silent gaps here and there, but among the gems is a great, bizarre Jack Palance story (something that seems to be a trend in any film the actor appears in). Disc 2 is where the nerd goodies are stashed, kicking off with the new Legends of The Dark Knight: A History of Batman (40m:36s), whereby the likes of Kevin Smith, Frank Miller, Stan Lee, Mike Mignola, and Alex Ross trace the origins of the comic character, mixed with personal remembrances and influences, all under the auspices of Mark Hamill (no stranger to the Batman mythos as voice of The Joker on the animated series), who narrates. Of historical interest is On the Set with Bob Kane (02m:33s), where the late creator of the man/bat vigilante speaks of his "golden pencil" and the development of the Burton film. But then it really takes off with Shadows of the Bat: The Cinematic Saga of The Dark Knight (01h:11m:40s), a well-rounded three-part doc broken into the sections The Road to Gotham City, The Gathering Storm and The Legend Reborn, with Peter Guber, Tim Burton, Jack Nicholson. Robert Wuhl, Danny Elfman, and Michael Keaton chiming in on the project. Production values make this look like an offshoot or leftover from the Legends of The Dark Knight: A History of Batman piece, but it is really done up in high style, and covers just about every element of production, including the work of Prince. Then it's time for Batman: The Heroes (12m:34s), offering up inside looks at Batman, Vicki Vale, Alexander Knox, Commissioner Gordon and Harvey Dent, and then the flipside with Batman: The Villains (07m:19s), with The Joker and Bob The Goon getting a shot at the spotlight. Beyond Batman (50m:53s) is yet another in-depth doc (that's the third for this release), split into six pieces, covering Visualizing Gotham: The Production Design of Batman. Building The Batmobile, Those Wonderful Toys: The Props and Gadgets of Batman, Designing The Batsuit, From Jack to The Joker, and Nocturnal Overtures: The Music of Batman. This one relies more on behind-the-scenes footage than the others, but the level of info is detailed without being particularly frilly. Excellent. Yes, the ballyhooed and oft-discussed near appearance by Robin in Burton's film gets coverage here, under the banner of Batman: The Complete Robin Storyboard Sequence (04m:24s). This is an animated visualization using pre-production storyboards from an early Sam Hamm draft, with sound, showing what would or could have been the first appearance by the boy wonder. Finishing things off is a curiously weak link, a set of three music videos from Prince, for the songs Partyman (04m:00s), Scandalous (04m:17s) and Batdance (06m:57s). I never really warmed to Prince's musical presence in the film, and the videos are laughably dated, but oddly watchable, in a strange "this passed for coolness?" kind of way. I would have preferred a standalone Danny Elfman audio track, but I'll get over it. Warner Home Video may have taken a long time, but this two-disc special edition of Tim Burton's take on the Batman mythos is a beaut. It's not just the smart new image transfer and the inclusion of a DTS track, it's that there are several new docs on Disc 2 that really sell the deal. Well worth a double dip.